Dancer Amalyah Leader ’19 has found her passion in flamenco. Dancer Amalyah Leader ’19 fell into flamenco’s embrace at age 13, when she decided it was a better fit for her expressive style than ballet. By high school, the Northampton native was traveling to New York City two times a week to train with a flamenco teacher there. At Smith, Leader twice received an international experience grant to study the passionate, rhythmic dance in its birthplace of Andalusia, Spain. Back in Northampton, in her junior year she produced and performed in a pair of sold-out shows featuring some of flamenco’s top artists. Now she’s spending her senior year at the University of New Mexico in Albuquerque, where she can be immersed in Spanish and Latin American studies—her dual majors—and also help get a new flamenco school off the ground. Here, she talks about flamenco as a cultural force. GOING TO SPAIN SPARKED EVERYTHING. When you’re in Spain, it’s just a whole different animal. You’re surrounded by flamenco, and you experience it as a way of life because it is a way of life there. People are singing in the streets; the rhythm is constantly in everybody’s ears. It’s everywhere. FOR ME, FLAMENCO IS ALL ABOUT feeling. We associate it with passion, with deep feeling. So whether it’s anger or grief or happiness or celebration, flamenco feels it. And the dancers interpret that in a very deep way. I see flamenco as one of the only moments in my life where I am forced to be very present to my emotions. It is spiritual for me because it allows me to connect to people in a very human, honest way and also to connect to myself, to feel the things I need to feel. SPANISH IS AN IMPORTANT PART of it. People try to learn flamenco without knowing Spanish, but you can’t really do that. First, the terminology is all in Spanish. And second, the cante, the song, is so important. Once you start translating and hearing the song and understanding it, it brings a whole new level to flamenco, in both its history and where it comes from. I HAVE AN AMAZING ADVISER. Her name is [María] Estela Harretche, and she’s both my Spanish and Latin American studies adviser. She saw the connection that flamenco has with Spanish and Latin American studies and she encouraged me to explore that, even though it wasn’t in the Smith curriculum. She allowed me to do an independent study on flamenco. I read a lot and studied a lot about history. She also taught a class on [Federico García] Lorca, the poet, and in collaboration with some musicians and another dancer I did an interpretation of one of his poems through flamenco. IN FLAMENCO, THERE’S A COMMUNICATION between the dancer, between the singer, between the guitarist, between the palmero, the person who’s doing hand clapping. People say it’s like an improvisation, but there’s a language to that improvisation. And for somebody who didn’t grow up in Spain and didn’t grow up learning that language, you can master it, you can become fluent in it— like any language—but that takes time. 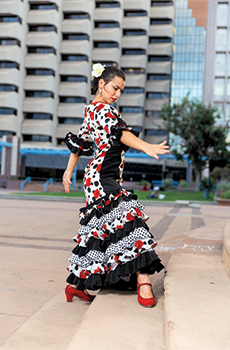 ALBUQUERQUE IS A HUGE HUB for flamenco. I got a Praxis [internship] to come here and work for a nonprofit called Flamenco Works Inc. It’s a flamenco school, and we’re starting from the ground up. It’s mostly committed to teaching young people, but it’s also committed to training professionals—so I’m here training every day but also getting my hands dirty. I hope to continue throughout the year, and then also when I graduate. I would love to be a part of it long term.